Hi there sweet friends! How are you! The end of another week is upon us, can you believe it? The time has just flown by, can't believe it's October already! And now we're 3 days closer to MARKET. 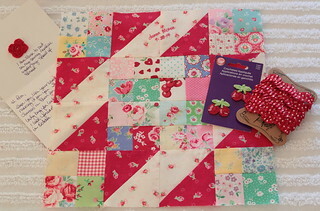 This week I had some happy mail from my friend Donna, it's the first of my Sew Sweet Bee blocks! I chose the Sunny Lanes block and I love how Donna's turned out. She included some super cute treats in with it. I can't get over how clever that little crochet flower is, she uses them under her thread on the sewing machine. It really is miles cuter than that little felt donut right? Anyway I had everyone sign their block so I can remember this year sewing along with everyone! I am sew happy you like your block. It was so much fun to make. I can not wait to see what you are making. How exciting to get some sweet yardage of your new fabric. I am so looking forward to having your line in my shop. I hope we'll start to see some Pam Kitty fabric soon. 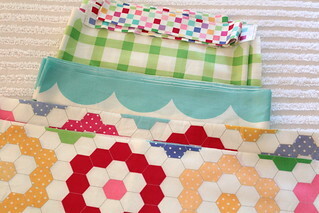 Will you have a new collection or are you only working on the Sunrise fabric? Looking forward to pictures of Pam Kitty fabric ! On the long boring 5 this AM. But snuggles this afternoon from sweet little girls! Can't wait to see photos of Pam Kitty Garden!!! Cute block! love those fabric choices. Can't wait for Pam Kitty Garden! Cheater print! Those are made for quilt backs, so fun.